BioticsLab is an official map for Killing Floor. 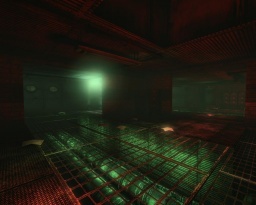 It is one of the release maps, and is a remake of the Killing Floor Mod map of the same name. BioticsLab is a medium-size map that comprises narrow corridors, stairwells, and open rooms. Players start outside of a wrecked elevator, at the base of a T-shaped junction. Straight ahead at the end of the corridor is a stairwell, leading down to another set of corridors with a U-shaped room leading off it. From the right of the start point is a small room with an ammo pickup. Taking the left corridor from the start point leads you through a door that takes you down another corridor to a stairwell, leading to one of the trader locations. Specimen spawn points are scattered around the map, all of them either in the corridors, inaccessible spawn areas, or ceiling vents. From the start point, walk towards towards the double doors and the end of the corridor, and turn right. Move a few paces forwards and turn left around the corner. A few paces down the corridor is the trader in the right side of the wall. From the start point, take the left corridor and go through the door. Turn right and continue to the end of the corridor, down the stairs. 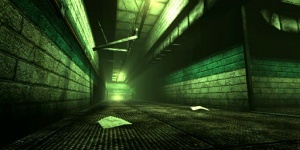 At the end of the next corridor is the trader on the right. In the U-shaped room with two sets of double doors, the trader can be found in the corner of one of the rooms. Generally it is easiest to camp in one spot, since the tight corridors and hidden vent spawns can make it difficult to move around in sticky situations. Many people prefer to hold the area around the start point, since you have a good view of all 3 corridors and you usually have somewhere to run if things turn bad. Another good place to hold is the U-shaped room, welding the double doors near the trader and holding the other doors near the stairs. Be sure to stay in the line of sight of the corridors, since moving just around a corner will allow specimens to spawn right next to you. The Patriarch can be beaten by locking him in one of the numerous rooms, and rushing him with powerful weapons such as the chainsaw or scythe. Alternately, a good strategy (particularly for solo players) is to close (but not lock) a door, and place several pipe bombs just in front of it. When the Patriarch opens the door he won't have time to react before they detonate, and since the door is closed he won't target them with his rocket launcher from afar. Note that locking the door will cause him to attack it with rockets, causing the pipe bombs to prematurely detonate. It is also important that the patriarch enters the door on the side with no pipe bombs. This page was last edited on 8 December 2012, at 07:13.